A report on the discussion about the tenability of colonial monuments? how do we deal with monuments that represent the colonial past? The chair of the discussion, historian Wim Manuhutu, gave the final word to Jacqueline Grandjean, curator and director of the Oude Kerk. The common ground is symbolized by the word kerkop, which is Indonesian for the Dutch kerkhof or graveyard. The shared Dutch-Indonesian past can be discerned in the language, but in monuments and buildings as well. The Oude Kerk is a graveyard, as we are literally sitting on the large tombstones of the Dutch East India Company’s seafarers. Grandjean invited specific people for this afternoon’s discussion, but was subject to criticism nevertheless. 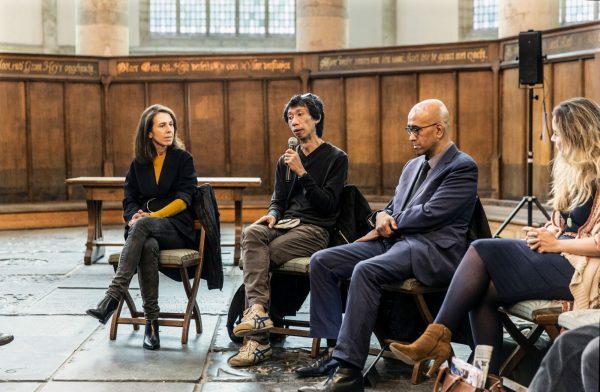 Why should this discussion be conducted in a place like the Oude Kerk? It seems inappropriate, as it represents the collective memory of the ‘glorious’ past, the urge to preserve everything as it was, the protectionism of one’s own history that is so tendentious. But what does that ‘one’s own’ actually mean? The afternoon of discussion was by no means an accompanying fringe activity, but another important function of a contemporary museum like the Oude Kerk. It provides a space for open debate and conversation, the interchange of thoughts stirred up by the sensibility of artists. For it is artists who pose the questions that are intended to prompt us to look at things in fresh ways and offer alternative guidelines. On this occasion the reason is the exhibition by Indonesian artist Iswanto Hartono that is currently on show in the Oude Kerk. The reference point in Hartono’s work is the colonial past that connects Indonesia and the Netherlands. Despite the topic being inextricably linked with politics, that is not Hartono’s point of departure. He places the emphasis on the elucidation of the topic from diverse perspectives. Hartono enters into interactions with spaces. The first time he visited the Oude Kerk he was impressed by its beauty, but he also noticed the connection with the colonial past. It is not the political tension that interests him, but the human tension. How do we remember? And how do we forget? He tries to open the subtle dialogue and avoid looking away from the dark side of history. By avoiding a top-down approach to the subject, but by creating a horizontal manner of thinking. During the discussion we sat in a circle. Everyone could see everyone else and was welcome to contribute. Ultimately it is not about the buildings and monuments themselves, but about the stories and the people. And the questions that arise and are asked have changed over time. Rijksmuseum curator Harm Stevens argues that it is therefore the function of the museum to invite people to critically reflect. He wrote the book Gepeperd verleden. Indonesië en Nederland sinds 1600 (2015), released in English as Bitter Spice: Indonesia and the Netherlands from 1600, in which he examined objects from the Rijksmuseum’s collection in order to re-consider their history. The book was initially released in Dutch and English, and is set to appear in an Indonesian translation this coming December. Stevens is curious about the reactions, and hopes that the book will be a pretext to enter into a discussion with Indonesians. He ascertains that there is also a burgeoning interest in this shared history from Indonesia. The artist Kaleb de Groot happens to be sitting next to him. For his work Counter Memory 010 (2016) he visited Aceh together with Iben Trino-Molenkamp and investigated the collective memories of the Aceh War. He asked the local population how they thought a monument for this horrendous war should look. De Groot expressed his astonishment with regard to the book by Stevens: Why was an English translation released first, instead of an Indonesian one? He was also critical about the failure to return objects from the Rijksmuseum’s collection. In his opinion, by way of the book this is now only being done in the form of a reproduction, which gives him a strange feeling. Stevens indicated that this is a topical subject and is on the agenda. He also referred to the ‘Lombok Treasure’, which was in large part returned to Indonesia in 1977. Hartono shed light on the subject from the perspective of modern-day Indonesian society. The restitution of artefacts is a symbolic gesture, but he emphasized that people in Indonesia are ignorant of many aspects. Of greatest importance is that the past should be made visible in order to open up the history for everyone. He calls for the sharing of the shared history. Amsterdam Museum curator Annemarie de Wildt joined the discussion here with a personal memory. In Suriname she visited the remains of the Sugar Trail plantations. For the Dutch it arouses a sense of guilt because of the great many plantations and slaves, but among the Surinamers themselves she noticed much less awareness of the past. Hartono noted that there are also many sugar factories in Indonesia that have fallen into disrepair. These buildings do not fall under heritage protection laws. Architect acquaintances are busy with the restoration of some places, but one argument for this is that they are also tourist attractions. The colonial past is hip with the youngest generation of Indonesians. It is swathed in an air of romanticism, probably in part due to a lack of knowledge. Herman Meijer, who works for the Rode Hoed centre for debate and culture, was curious whether there are still streets in Indonesia with Dutch names. Hartono explained that most of the names have been changed, but that the old names live on in the memory of Indonesians and are often still used. The artist FX Harsono was also present. He added that colonization is something you can be proud of, but being colonized is not. In my opinion this is a stubborn misapprehension that underscores the need for these open discussions. Harsono is currently exhibiting work at BOZAR in Brussels as part of the Europalia Arts Festival, with Indonesia as its central theme, of which the exhibition by Hartono at the Oude Kerk is a component. FX Harsono’s work is part of the main Power and other things – Indonesia & Art (1835-now) exhibition in Brussels, where 21 Western and Indonesian artists are presenting their work. He described the work of the young artist Dea Widya. At the spot where the Hotel des Indes in Jakarta used to stand, there is now an ugly shopping mall. She produced a clay scale model of the hotel, but the clay has fissures so the shopping mall is visible underneath.